Do you have a bucket list? If so, I have a suggestion for an addition: hike a glacier. A few weeks ago I flew to Iceland with my friends Lenore and Tricia. Fresh off a red eye, we hopped into a microscopic Toyota Yaris and drove straight across the bottom of the country. Iceland is an ideal place for a road trip (at least in the summer). Extra hours of sunlight guide your journey, not so many inhabitants (traffic jams are caused by horse crossing more than rubbernecking), and gorgeous views from your window most of the way. Also, there is one main road aptly called “Ring Road” that circles the perimeter of the island which makes touring easy. 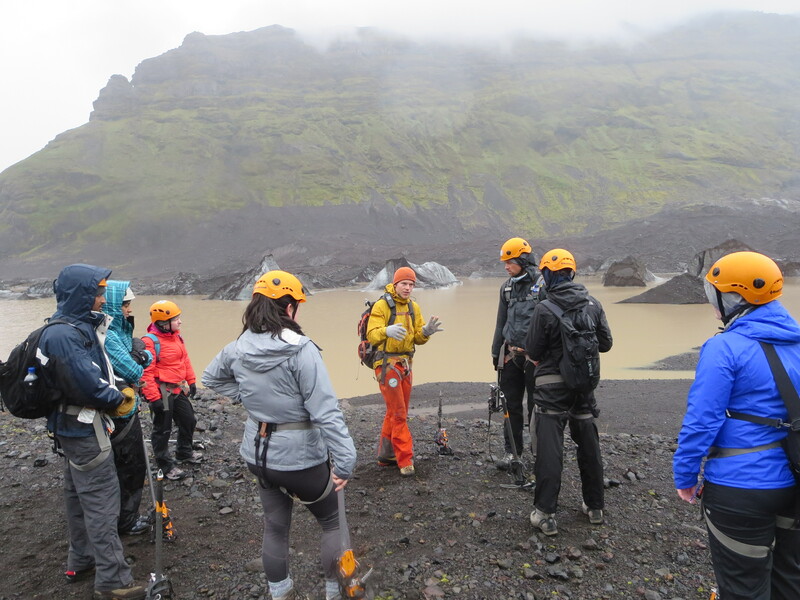 Our destination that day was Skaftafel National Park which is part of Vatnajökull National Park. This park is known for some massive glaciers, the biggest icecaps in Europe, actually. And we were going to hike one. We arrived late Friday night and at roughly 9am the next morning a “American yellow school bus” (as described by the charming Icelandic man at the hotel) pulled up to the lodge and a woman brought us aboard. The bus was packed. About 36 strangers sat quietly and stared at us. Also they were holding axes. Yes, like a sharp, dangerous weapon. I nearly ran off the bus since starring in a live action horror movie wouldn’t be on my bucket list even in the roughest of drafts. In harsh tones the Icelandic woman told me to sit down. 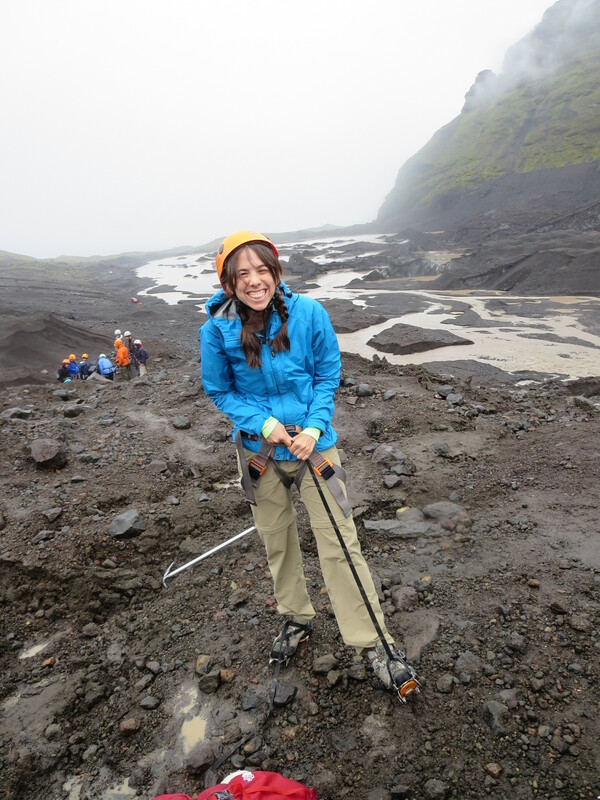 She handed us boots and we drove about 20 minutes to the base of the glacier. There, we received helmets, crampons and yes, an ice pick. 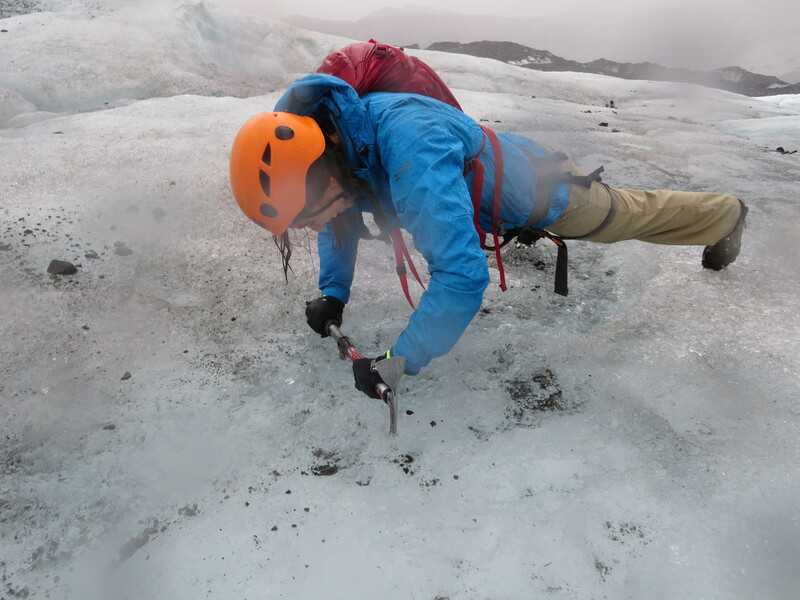 You need an ice pick to hike a glacier. We hiked for about an hour without crampons, through mud and at a slight incline. 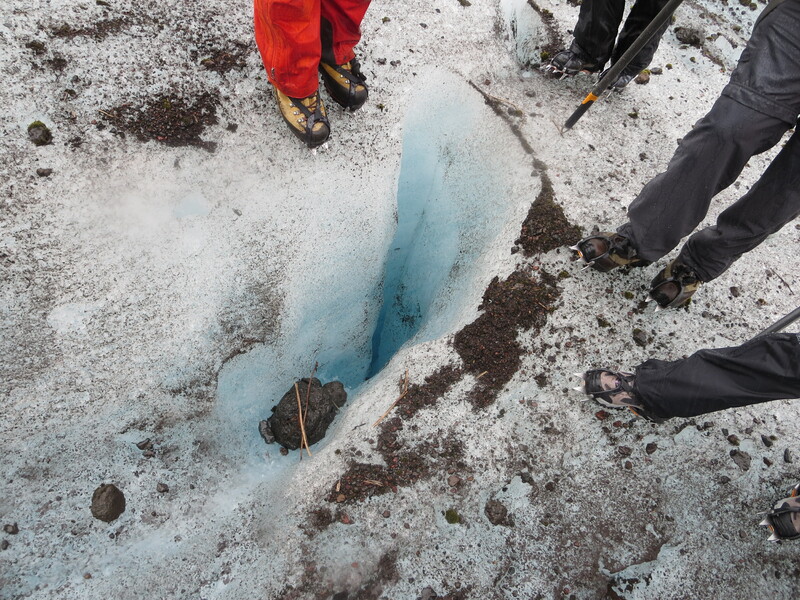 Ahead of us was a massive white glacier, and we marched toward it. When the ice got close, we stopped and put on crampons. I like to think of crampons as sharp teeth for your feet. To avoid slipping on the ice, crampons are sharp metal braces that allow you to dig into the ice instead of skating on the surface of it. Our guide explained how to walk. Uphill: Bend your knees and keep your feet pointed forward. Downhill: “Walk like a rapper”, bend your needs and lean back into the hill. Sidestepping: Keep one foot pointed down the slope. As we climbed higher and higher, the colder it got and the more it rained. When the group would stop for a huddle to discuss where we were going next, the lack of movement made me shiver. I had to bounce around to stay warm. We hiked on the ice for between 3 and 4 hours. It was gorgeous. I had never before experience icey vistas or been that close to a glacier. The ice mass is melting (because of climate change) and so there are ravines with water racing down them. Our guide chucked his axe over the running water and I did a plank. 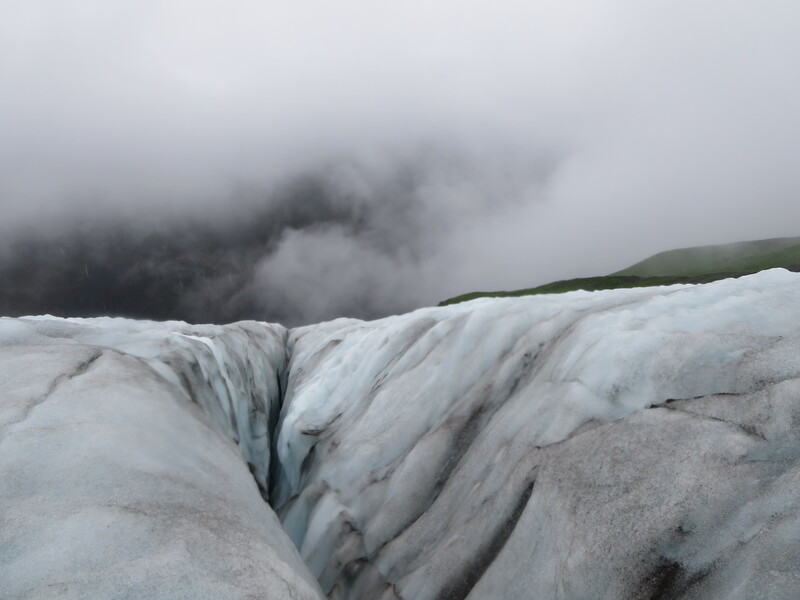 The rushing water changes the shape of the glacier. Day by day the differences are minor, but our guide explained that when he takes a week off, the slopes look completely different upon his return. Just ONE week! Heading down from the glacier, and looking back up, I felt an awesome sense of accomplishment, even though the hike wasn’t insanely physically taxing. There is no base skill level to do this. If you can walk up a hill, you can totally do this And you should! 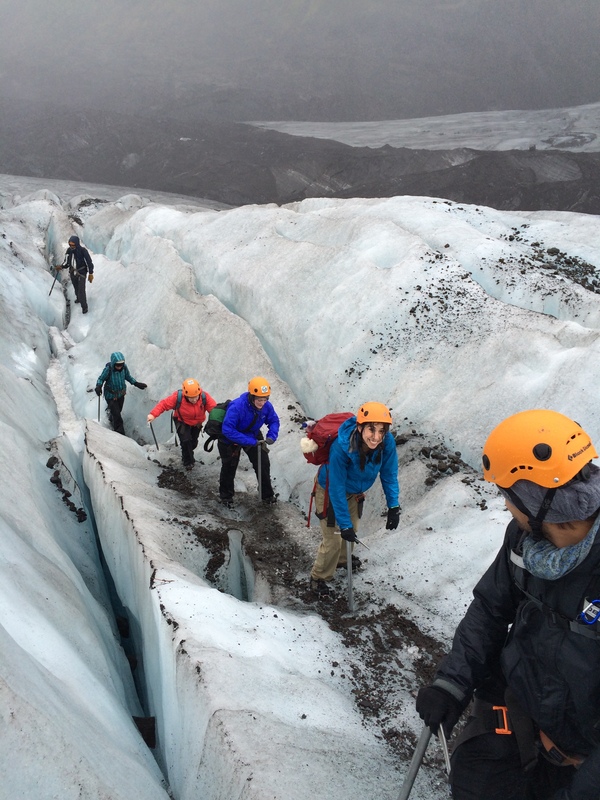 Have you ever hiked a glacier? What’s on your bucket list? Great post, but it’s called a nice ax! Not a pick… But who is counting? This was a really interesting article! I had the same reaction you did just reading about you joining a bus full of strangers all wielding axes. 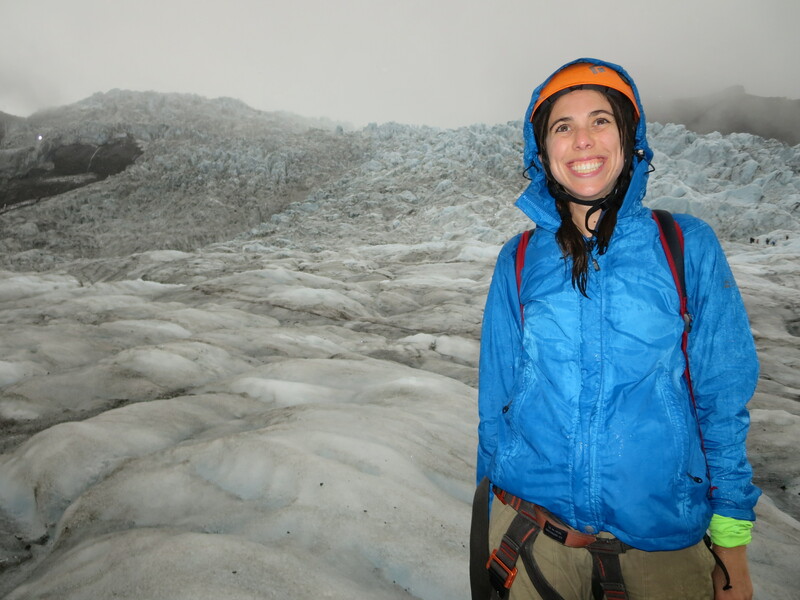 Hiking a glacier sounds like a really intense experience and I commend you for accomplishing that task.